Want to test your knowledge about the liver? Do the quiz! Which one of these sentences is correct about the liver ? It is the largest organ of the human body. The liver can regenerate itself, and is vital for us. It approximately measures 10cm of length. 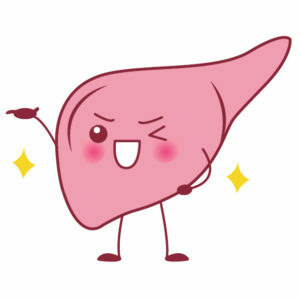 Indeed, the liver weights little more than 1.5kg. Just in the middle of the rib cage. Important if you need to do a liver exam : remember that it is located on your right side, contrary to the heart. These are its three vital functions: to eliminate toxins (especially the ones found in alcohol), to insure some metabolisms (carbohydrates, lipids and proteins), and stock the energy under the glycogen form. Which of these functions is not performed by the liver? As we mentionned before, its three main functions are : toxins purification, nutrient synthesis, and energy storage. Fibrosis is a liver scar tissue. It develops when the liver cells have been damaged, when they have suffered from chronic chemical aggressions, such as excessive alcohol, or virus. Yes, if the cause of the disease is treated and if the lesions are not too severe. Liver damage whereby normal liver tissue is replaced by scar tissue caused by long term damage. Cirrhosis is not a cancer, but a liver state, including long term fibrosis. Common causes of liver damage include alcohol, viral hepatitis, or non-alcoholic fatty liver disease. Hepatitis is not a liver cancer, but a liver inflammation. There are several types of hepatitis: viral, alcoholic, steatohepatitis, autoimmune hepatitis, acute hepatitis. By which way hepatitis B cannot be transmitted? Simple physical and skin contact does not allow the virus to go from one host to another. Which of the following is a mode of transmission for Hepatitis B, but not for Hepatitis C? Transmission through sexual contact is rare. The risk exists in case of blood presence during sexual contacts. Steatosis, commonly known as "fatty liver disease", is an accumulation of fat in liver cells.